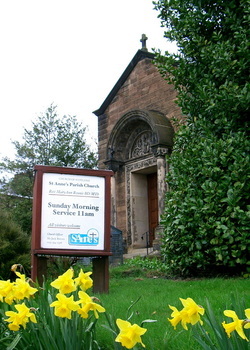 Worship at St Anne’s follows a traditional pattern of Church of Scotland with the Word of God taking central place in the proceedings. Morning Worship is at 11 am every Sunday led by our minister, the Rev. Jamie Griggs with singing led by the choir and organ. Before heading to their Sunday School groups the children are welcome to the early part of the service, and as well as listening, occasionally take a more active part in worship. There are a number of occasions throughout the year when Bible Studies are offered. The Sacrament of Holy Communion is celebrated on the last Sunday of January, April, June and October at 11:00 am and at 3:00 pm on the last Sunday of January. On the last Wednesdays of April, June and October the Sacrament of Holy Communion will be celebrated at 7:30 pm. In Holy Week, there is a Communion evening service on Maundy Thursday, while on Good Friday all the Corstorphine churches join together for an evening service in a different church each year. Christmas services include a Service of Lessons and Carols, a Christingle Service, a Watchnight Service and a Family Service on Christmas Day.